Recently on the endless stream of half-formed thoughts that keeps me sane in the office, which is to say Twitter, I was approached by someone who likes my work and thinks highly of it. While I take this as a humbling and honoring thing, I was troubled by this as well, since they asked if it was a bad idea to take the Table of Practice design I developed based on Fr. Rufus Opus’ coursework and use it as a tattoo on their body. I told them bluntly that, yes, this is indeed a bad idea. Why? Because the Table of Practice pattern is a combination of spiritual geometry and sacred names that is put together in such a way so as to contain and manifest spirits; this is the point of the diagram. 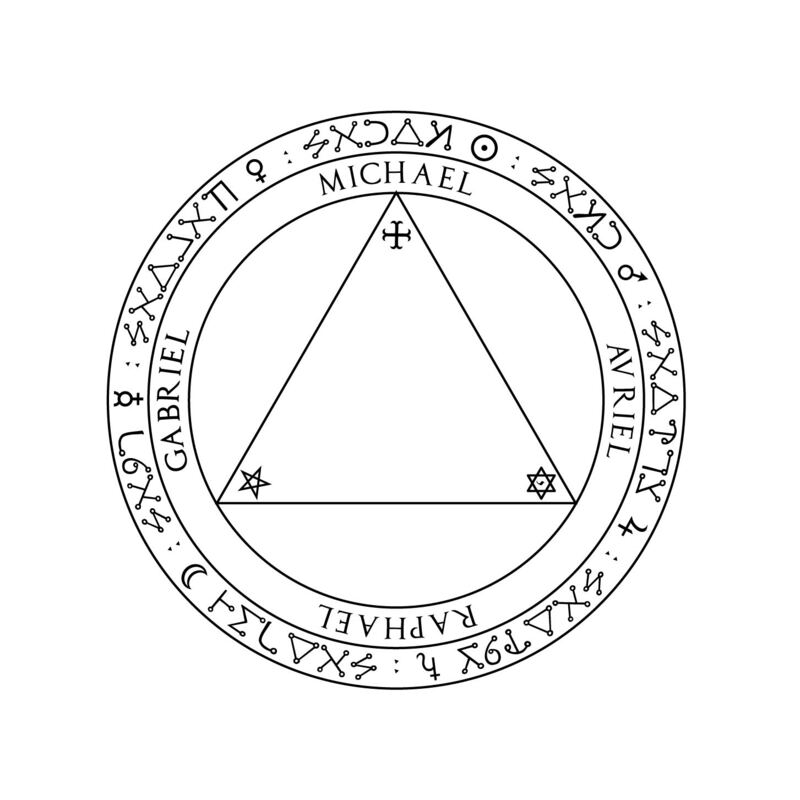 To have this on their body would mean that, wherever they go, they risk having spirits collect on their tattoo with or without their knowledge and, worse, to give those spirits form and place in the world without actively working with them or even attentively or intentionally calling upon them. These things happen anyway, which is why regular cleansings and baths and banishings and the like are so necessary, but to trigger that even more than it happens on its own and in a more dangerous way is a terrible, awful, no-good idea. Worse, the person in question wanted to use this for spiritual protection, which is not the point of this design at all! It can be used for containment and isolation, sure, but it is not primarily intended for that, and has way too many side-effects that make this a poor choice for a protection tattoo. Put simply, this person was coming from a place of ignorance, a place which I hope I was able to help them out from. The occult world is full of arcane geometries, obscure patterns, and unusual shapes that many a graphical artist would love to get their hands on or take credit for. Add to it, so much of this stuff is just so cool-looking (and if you’re one of the vast majority of people who get into the occult, you got into it because it looks so freaking awesome). There’s a heavy and high danger in this, though, because if you merely work with this stuff because it looks cool, you often overlook how powerful and grave and serious this stuff is. It’s easy to forget that these things that appear so simple are in and of themselves so dangerous; a simple stray mark, a vowel pronounced with the wrong intonation, the wrong type of pepper used in incense, or such minor differences could honestly and hugely change how something works. Just because something looks simple and straightforward doesn’t mean that it can be used in a simple and straightforward manner. This stuff is called the occult, and the word “occult” means “that which is hidden”. This stuff is not always apparent but always needs to be studied and mulled over for it to make sense and for it to click. Picking something up and running with it is a bold move, and can easily cross over into folly; without a firm understanding of what you’re doing and to what end, as well as the construction of the tools and designs and artifices you’re using, you could really hurt yourself or those around you. This goes double for tattoos of spiritual designs and artifices, because you’re literally and permanently transforming your body into an occult tool or a container for occult forces and entities; you need to take extra care when getting a spiritual tattoo because you may be biting off far more than you can chew. I’m glad you’ve written on this subject. Spiritual tattoos should not be done ‘just because they look cool’, I’ve seen this around so many times it makes my head hurt just thinking about it. Getting my own one done took me about 4-5 years of consideration before I went along with it and it was done considering all the factors I could think of, including the right timing. Common sense. Gosh, what’s the occult world coming to? can i write sigil teftin or … on the Fire Wand ? i am novice , And I am studying.